Heavy-duty rugged and all-day comfortable. Runs Bigaria-label="A rating of 1 means too small, a rating of 5 means too big, a rating of 3 means true to size. This items average rating is 2.5. 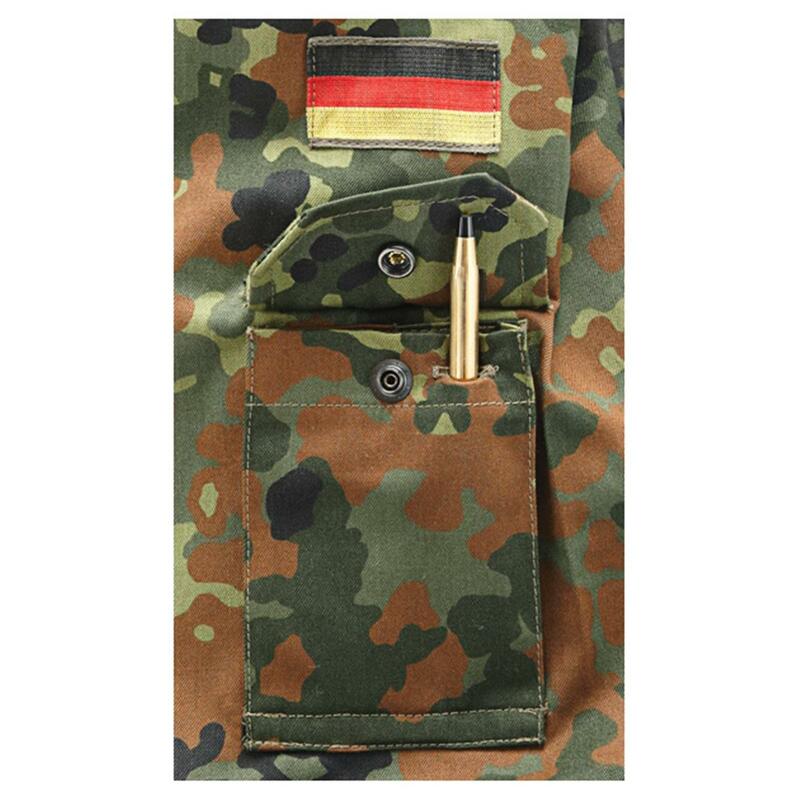 For hunting, casual wear or everyday military surplus style. Heavyweight cotton and polyester blend wears like a tank but won't hold you down during high activity. 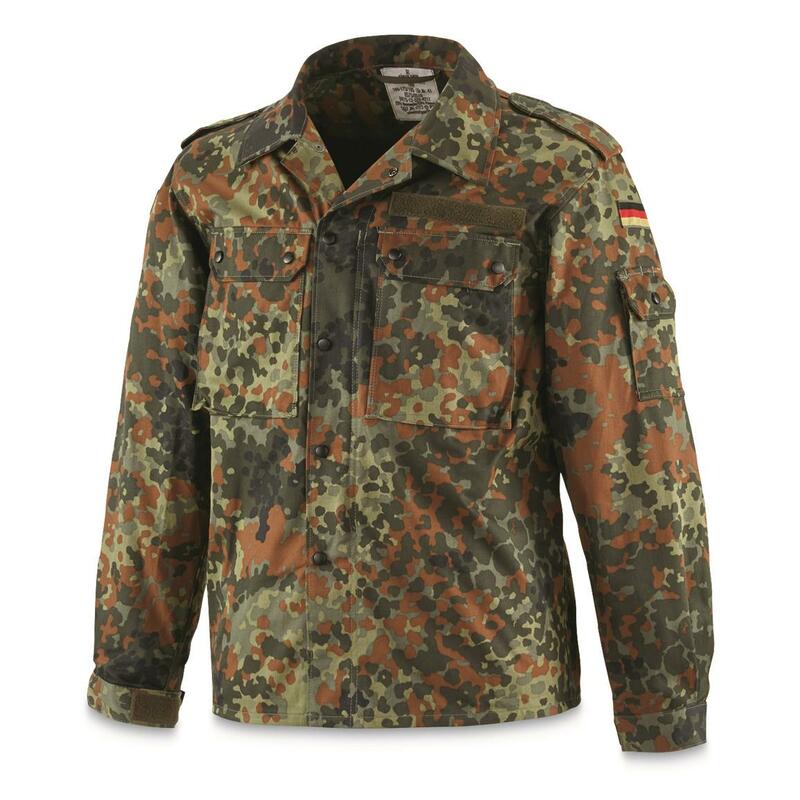 Top quality German manufacture, using a bold Flecktarn camo for stealthy operations in a wide variety of temperate terrain. Ready for your next mission! 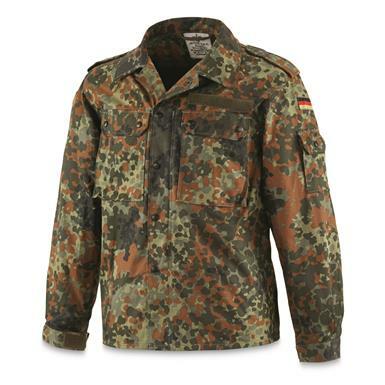 German Military Surplus Field Shirt, New is rated 4.8 out of 5 by 34. Rated 5 out of 5 by mailman1 from great summer jacket zipper instead of buttons. liked that very much. fit was perfect for me. great light shirt to wear around. Rated 5 out of 5 by JRoy from Nice cool looking shirt This shirt has nice vibrant colors and is perfect for staving off cool breezes without the bulk of a jacket. The pattern blends well with early spring woods in the southeast. I normally wear a large and the large in this shirt fits the way I want it to. Rated 5 out of 5 by nate from New I ordered 3 XLs and they were all GrNr 10. I recommend ordering one size up. They were made in the late 90s but completely new. They have vent holes in the armpit area. Rated 5 out of 5 by Adam from Brand new Yep, brand new, never work. Not entirely sure if it's military issue though, has a "Sturm" sticker in it with "made in Germany" - in English on the inside. Regardless, it fits great and is as described. Sizing is spot on for US sizes. Rated 5 out of 5 by Dick257 from Nice Shirt Ordered one size larger as suggested in reviews and it is perfect fit. Removed flags and grip strip before washing and you would never know they were there. Nice shirt and love the camo pattern. A trio of rugged yet comfortable long-sleevers! Runs Bigaria-label="A rating of 1 means too small, a rating of 5 means too big, a rating of 3 means true to size. This items average rating is 3.4. Military-inspired comfort for the field. Runs Bigaria-label="A rating of 1 means too small, a rating of 5 means too big, a rating of 3 means true to size. This items average rating is 1.3.